When Stephan Grupp, MD, PhD, began enrolling patients in the clinical trials for what would become the first-ever gene therapy approved by the US Food and Drug Administration (FDA), his problem wasn’t finding volunteers — it was reigning in expectations. Grupp, a pediatrician at the Children’s Hospital of Philadelphia and a professor of pediatrics at the University of Pennsylvania’s Perelman School of Medicine, led the global clinical trials for Kymriah, a personalized therapy that uses chimeric antigen receptor T-cells (CAR-T cells) to target B-cell precursor acute lymphoblastic leukemia (ALL). Parents who came to Grupp were running out of options, and they’d heard amazing things about the potential of CAR-T cells. This left Grupp in a tricky position. On the one hand, he knew the technology had the potential to be revolutionary. But on the other hand, this was a clinical trial, and like any clinical trial there was a chance the therapy wouldn’t work — and a chance it would lead to side effects. The most common side effect is cytokine release syndrome, a potentially life-threatening reaction. Grupp didn’t want to oversell the therapy, yet he knew it could represent a dream come true for his patients and their parents. “Their kids have been in the system for a long time and if this doesn’t work, they’re not going to survive,” he said. As the study unfolded, the drug’s potential became a reality. Eighty-three percent of patients who were given Kymriah achieved either complete remission, or complete remission with incomplete blood count recovery, within 3 months. The results Kymriah’s eventual FDA approval last August, for patients up to 25 years old. The decision notched a major win for drug-maker Novartis, and ushered in a brave new world of gene therapy. Since then, 2 other gene therapies have joined the market: Yescarta, a CAR T-cell therapy marketed by Gilead to treat certain types of large B-cell lymphoma; and Luxturna, Spark Therapeutics’ gene therapy for a rare form of inherited vision loss. The latter made its own history, becoming the first approved gene therapy for an inherited disease. 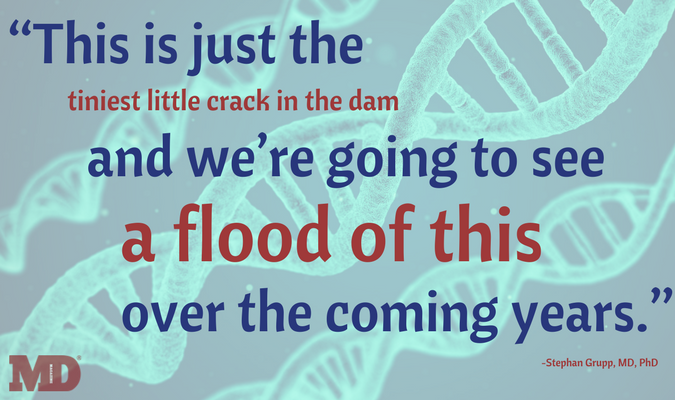 Though those 3 therapies are the first, they won’t be the lone gene therapies for much longer. More than 700 gene therapy-related clinical trials are planning phase or ongoing, according to ClinicalTrials.gov. In addition to the CAR-T cell therapies, the CRISPR-cas9 gene-editing platform — first announced in 2013 as a new way to edit genes — is opening up additional avenues for gene therapy. The first CRISPR-related clinical trials are expected to launch later this year. A firm called Crispr Therapeutics plans to launch a trial of a therapy for the blood disease beta-thalassaemia. Meanwhile, Editas Medicine plans this year to launch a trial of a therapy to treat Leber Congenital Amaurosis, a rare form of congenital blindness. With the blink of an eye, gene therapies went from a faint hope to a potential conquerer in a vast number of rare diseases, Kevin Giordano, a spokesman for Spark Therapeutics, the maker of Luxturna, said. What’s more, these therapies could represent a new paradigm in healthcare, Giordano said, because 1 treatment could potentially create lifelong cures. That’s not to say there’s no obstacles in the way of gene therapy. Much of the research in gene therapy has focused on diseases of the blood and bone marrow, such as cancers, hemophilia, and sickle cell disease. But Grupp said those are the easiest targets. Solid tumor cancers are trickier, because they have mechanisms designed to keep out T cells. Thus, any gene therapy would also need to incorporate a strategy to circumvent the tumor’s blocking mechanism. So far, no such strategy exists. Diseases like sickle cell disease, which are caused by 1 single gene, are good targets for gene therapy. But diseases like diabetes, in which risk can be affected by multiple genetic factors plus environmental factors, would be more difficult to treat with a gene therapy, Grupp said. Even with those limitations, the opportunity remains high. Grupp said he’s heard from numerous startups since Kymriah’s successful launch, and he said there’s an “enormous” number of firms looking to break into gene therapy. One reason is because it can be highly lucrative. In January, Celgene Corporation announced it would pay $9 billion to buy Juno Therapeutics, a startup focused on using gene therapies to target cancer. That deal was finalized this week. In announcing the deal in January, Celgene CEO Mark J. Alles said the deal was designed to help secure a role for Celgene as a leader in hematology by boosting its research capabilities. Of course, the high-dollar figures associated with gene therapies aren’t limited to mergers and acquisitions. The cutting-edge nature of the science, coupled with the relatively small numbers of patients, has led to massive price tags. Kymriah was given a list price of $475,000. Yescarta hit the market at $373,000. Luxturna, meanwhile, has a price tag of $425,000 per eye, meaning a two-eye treatment would come close to the $1 million mark. Insurers so far have been cautious, evaluating treatment requests on a case-by-case basis, and patient advocacy groups have in some cases complained that the high price tags are limiting patient access. For its part, Spark responded to price concerns by announcing in January new proposals for outcome-based payment models that allow insurers to link payment with efficacy. The company also proposed a contracting model to work directly with insurers, thus eliminating the medical centers from the payment chain, as well as the mark-up those healthcare providers typically add before billing patients. Giordano said Spark continues to be “encouraged by discussions with insurers and providers.” He hopes providers will have patients with inherited retinal diseases undergo genetic testing to determine if they are a candidate for gene therapy. In addition to driving payment model innovation, the high cost of the drugs is also incentivizing technical innovation. One such innovation is taking place at Washington University, in St. Louis, where assistant professor J. Mark Meacham, MS, PhD, recently unveiled a new method of inserting large molecules like DNA, RNA, and proteins into the nucleus of cells. The approach avoids using chemicals and viruses to deliver the DNA. Instead, it uses a combination of acoustic shear poration (ASP) and electrophoresis (EP), leveraging ultrasound waves and mechanical force to create pores that are large enough and stay open long enough to insert DNA. This method manages to complete the task without damaging the cell, Meacham said. Using a physical mechanism, rather than a virus, could help speed along the development of new gene therapies, Meacham told MD Magazine. Any perceived risk, even if small, can make a development program more expensive because it can add validation costs. Meacham added that the technique works for both CAR T-cell therapies, and CRISPR gene-editing therapies. He’s heard from multiple potential strategic partners, though he said it’s too soon to disclose details. If technology represents 1 ongoing challenge, regulatory hurdles represent another. Grupp, who helped shepherd Kymriah through the FDA approval process, said the agency has worked hard to keep up with the latest science. In a press release announcing Kymriah’s approval, FDA Commissioner Scott Gottlieb, MD, said the agency is working to be prepared for the age of gene therapy. The FDA will need to work fast. For years, people have been both impressed by the potential for gene therapy and anxious to know when it’s actually going to come to fruition. The wait will soon be over, Grupp said. But Who Treats The Doctors? Why Are EMRs So Terrible?